Preheat oven to 350 degrees F. Butter and flour 8 large muffin cups, or 12 regular-sized muffin cups. Combine gingersnaps, cinnamon chips, pecans, oats, and granulated sugar in a large bowl; knead in 3 tablespoons butter until mixture is well combined and starts to clump together. Set aside. In a medium sized mixing bowl, sift together flour, cornstarch, baking powder, salt, cinnamon, ginger and nutmeg in a medium mixing bowl. In a large mixing bowl, using a mixer on medium speed, beat together 5 tablespoons butter, oil and brown sugar until creamy, about 1-2 minutes. Beat in pumpkin and vanilla until combined. Beat in eggs until combined. Reduce mixer speed to low and beat in flour mixture, alternating with milk until just combined - about 1-2 minutes. Divide batter into muffin cups. Evenly top with gingersnap mixture, and gently press into the surface of the batter. Bake for 20-25 minutes or until well risen, golden brown, and a toothpick inserted into cake comes out with moist crumbs attached. Cool muffins 10 minutes before removing from pan and cooling. 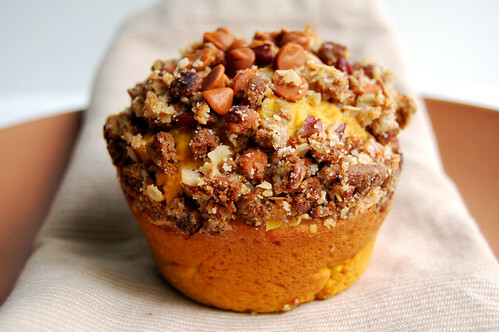 55 comments on "Pumpkin Muffins Topped with Gingersnap-Cinnamon Chip Streusel"
I need you to open a bakery (after culinary school, as a side line) so you can shop all of these amazing desserts, muffins, etc my way. The story was fun and congrats to all the winners!! So full of amazing flavors! I love the combination here! Man, that muffin is bakery worthy. Looks better than some things I see in a bakery case for sure -- just beautiful. I loved your little story -- I like 'word salad games' (hey that's a food reference). Haha, fun story; and those muffins sound DEEEEEELIGHTFUL. Oooh that muffin..... that mouthwatering muffin! You created such a yummy recipe. I'll have to try this with some pumpkin that needs cooking. wouldn't you just like to give a big ol' bear hug to the person who invented cinnamon chips? i know i would. What lovely presentation! Those are some pretty muffins! And congrats to the juice winner! Holy moly, Emily, these muffins look amazing. I want one right now! Why can't you be my neighbor? Very fun Mad Libs game. I loved Mad Libs as a kid! I must make these. I LOVE that topping! Do you think this batter would work w/ choc. chips mixed in and the topping left off? I have a great pumpkin & choc. chip cookie recipe and have wanted to make a similar muffin for awhile, but I'm just wondering if the spices in this would fight w/ the chocolate? Looks delicious Emily. I still can't get over that you write your own recipes!! I've been cooking a long time but have to always follow recipes (very closely)! You are very, very talented!!! oh i love tht shot of the muffin sitting on the napkin away from me. lovely! generous streusel topping which i love. your muffins are always so wonderfully shaped and creative! You are HILARIOUS! And you just changed my whole plan for the afternoon, because now I have to go to the store and get stuff to make these muffins RIGHT NOW. I should know better than to look at your blog before I've finished my to-do list! Your house must always smell amazing with all your baking. Between my steamed veggies and my husband's infatuation with bacon, it always smells like someone sh*t a Waffle House in our kitchen. loooks really good. where do you find cinnamon chips though? I liked the story. But you know what I REALLY like? That streusel top! That's like a super moist looking muffin! And that streusel, for me could be served with a spoon! Could these look any yummier!!! I would have a hard time eating just one!! Love the idea of the gingersnaps and cinnamon chips. Found you on Tastespotting today, beautiful photos!! Val, I would love to open a bakery. I think that's a splendid idea! Sarah, I think that would be fine. I love spice, pumpkin and chocolate together. C&T - YOU are hilarious. Heather, I would say 90% of the time our house doesn't smell that great. Vegetables, seafood... Have you noticed that popcorn smells too? Pretty embarrassing when you have guests over. Anon, I know that cinnamon chips are hard to find. I'm luck that my grocery store carries them. They don't carry them at Walmart, though. I would try looking at some grocery stores or ordering them online. You could substitute butterscotch chips, I suppose. But maybe chop them up a bit, because cinnamon chips are smaller. I work on the line next to the Blueberry muffin tops. It smells so good when we run them! I have a few recipes for cookies with M.O.M. but have never thought to put them in other baked goods. Looks good! Ughhh.. I just had some frozen yogurt, it would have been perfect with these muffins! Right in time for the holidays! Thanks much, Emily! Loved the story! I'm a sucker for anything with streusel, so I'm sure I'd eat quite a few of these! Wow! 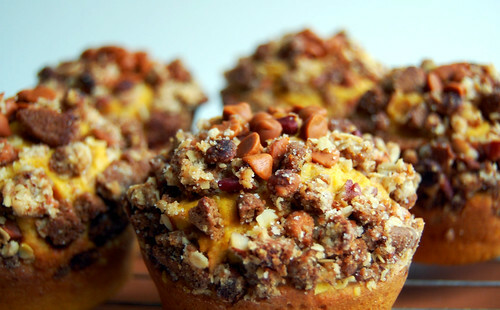 These are killer muffins! Love the cinnamon chips and crunchy gingersnaps on top. Pass the plate, please! Oh, sweet heaven, those muffins look delicious. I think I'll make those for our Thanksgiving potluck at work. Thanks so much for the awesome recipe! What t an amazing topping for pumpkin muffins! I jumped up and down at my local HEB because I found cinnamon chips and I will now be able to make these! 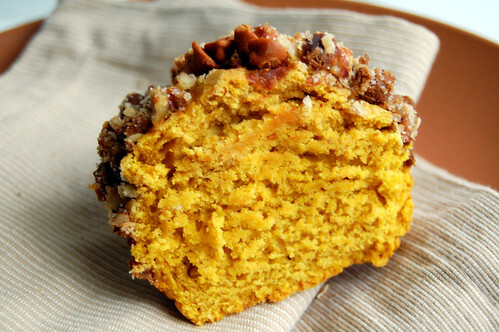 You sure know how to make a mouth water - and I don't even like pumpkin! These look delicious Em! I always know I'll see something delicious when I come here. Now that what I call a muffin! I've looked EVERYWHERE in my area for those cinnamon chips and can't find them. Guess I need to broaden my search. I just came across your blog and don't know how I have missed it!! I saw you on the food network show a while back and your sandwich, the pumpernickel pastrami has since become a family favorite! Your blog is super fun! Wow,...these treats are real delicacies!! Oh my goodness. I hadn't even gotten to the picture - only the title! - and I was enthralled. I love Thanksgiving because I love pumpkin and I am thankful for this recipe! Alice, I've gotta try it. Tamilyn, do you work at Malt-O-Meal? Hi Cookies and Cups! Welcome! Please drop by anytime. These look scrumptious - I think I could eat that topping with a spoon! The topping looks SO incredible! I'm going to make these, if I can find those cinnamon chips! 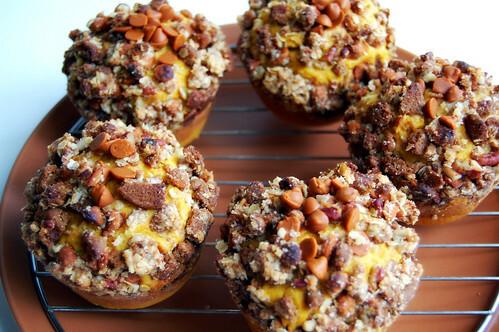 these muffins are over the top girl!! That is one of the best looking muffins I have seen! I need to make these! I made these the other day and was wondering, can I substitute apple sauce for the oil? And also, why do some recipes have butter and oil in them? I am used to recipes just having butter or oil. 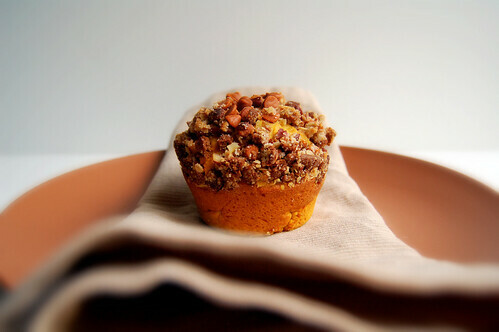 These pumpkin muffins look amazing, love the crushed ginger snaps in the streusel.